Another cool (to me anyway) old German car in my neighborhood. 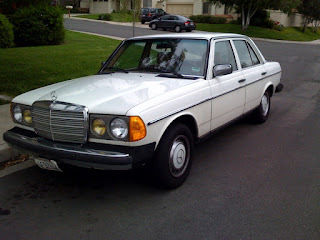 A W123-body Mercedes 240D. Produced when engineering trumped electronic doo-dads, W123s are arguably the best constructed mid-size Mercedes Benz models ever made. 240Ds have a special place in my heart. 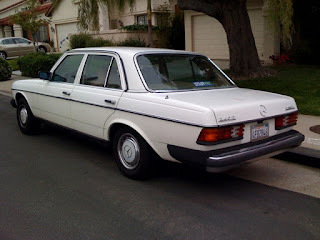 Sure, it looks like an old-man's car with the painted hubcaps and dog-slow 64HP diesel motor (the indestructible OM616 4-cylinder), but I racked up many miles in one of these during a high school job as a porter at a Mercedes/Porsche/Audi dealership. These cars feel like they were carved from a solid chunk of granite - and they've held up well too. The dealership's was dark blue and had about 250k on the clock but still looked and ran great. I should have checked the clock in this one, I bet it has over 300k.